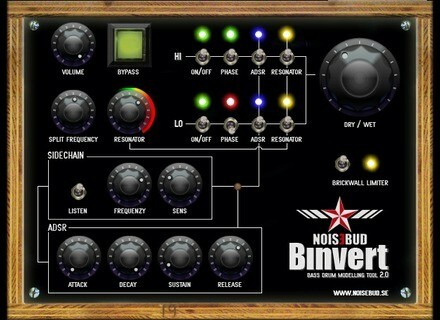 Binvert 2, Other Effect Plug-in from Noisebud. 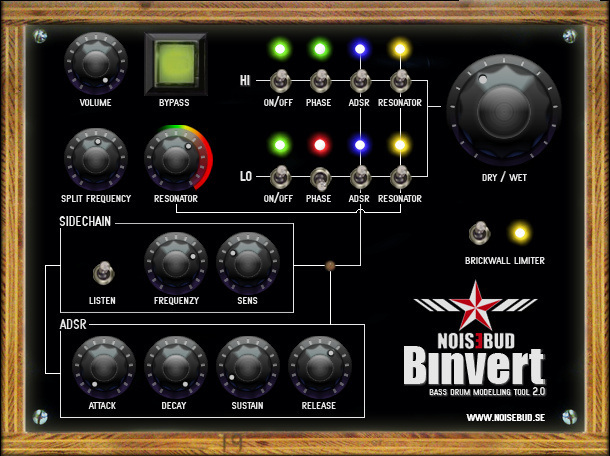 Noisebud starts 2014 with two updates for its Binvert and GranMa VST plug-ins, both available as donationwares. Version 2.0 of the GranMa granular VST for scratch effect adds a Freeze button and a timer that shows the length of the buffer. The behavior of the Release feature was also improved, as well as the playback engine. Binvert, the Bass Drum Modeling tool, has also been updated to version 2.0. The plug-in had been initially developed to help you handle the phase in multichannel mixes, but Noisebud explains that users of the first version were particularly interested in the extreme resonance option so it was decided to develop this feature in v2.0. Binvert can now also slightly boost the low-end in mastering. Binvert 2.0 adds a new brickwall limiter, a sidechain ADSR, a gain knob, a dry/wet control and a bypass button, and you can disable the resonator for each band. Both VST for Windows are available in two versions : the free version has a black and white GUI, while the donationware has a colored GUI. You can download them from noisebud.wordpress.com. iZotope RX 3 Review After adding the RX to its software catalog in 2007, iZotope has made a name for itself in the audio restoration world. The second version came out in 2010 and really drove it home making the software a reference in this domain. New Year’s Freeware: Cyclone A typhoon is about to blow your home studio away, or better said, the reproduction of the Typhoon launched 14 years ago for the Yamaha TX16W sampler. Monoplugs launches a bass step sequencer New german plug-in developer Monoplugs introduces b-step, a bass step sequencer for Mac OS X, Windows and GNU/Linux.